I was completely apathetic towards math when I was in school. It was hard for me and I pretty much stunk at it, which is probably why I probably had no strong connection to it. A catch-22 of sorts. However, like most people, I was totally motivated at all the things that I was good at, and I still am. There’s not a thing that I can think of that I am good at that I don’t also like doing and have some sort of passion for. I think that success–or even the potential for success–can be a very motivating factor. What’s puzzling to me are the people for whom this is not true. I have encountered too many students and athletes who are really good at something and still don’t like it. Often times, those kids who aren’t motivated to do the things at which they are skilled are also not motivated to do anything else, either; and that’s a type of apathy I just don’t understand. It sort of scares me that there are people who aren’t somehow motivated to succeed at something, anything–even something really simple and basic. It scares me that completely apathetic and unmotivated people even exist. A few years ago I wrote about the Seven Deadly Sins and how pride is traditionally considered the “deadliest,” but I think that “sloth” (apathy, laziness) has to be right up there near the top of the list. This is all on my mind right now, because in the upcoming week, my students and I will be discussing the Seven Deadly Sins. I don’t approach it with my classes from a moral point of view, so much as from a thematic point of view: it’s a major theme in literature. How many of the world’s woes are perpetuated by downright laziness and apathy? How many problems could be solved if enough people cared enough? Too many to count, I’m sure. However, I have to wonder how often apathy appears to be the cause of someone’s inaction, when it’s really something else…like being overwhelmed or tired or overworked. I am going to give people the benefit of the doubt and assume that’s the reason so many people/teachers are not taking a stand against some of the forces that are attacking public education. 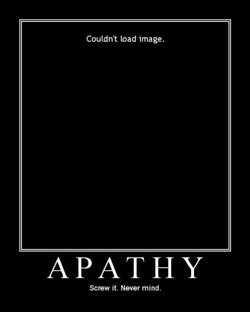 I hope that I am right, because the thought of it being apathy is just too hard for me to bear.